Well, some might say it is just a rock in the middle of Australian Red Centre, right? Are you wondering what is all the fuss about and why are so many people willing to undergo tiring journey only to get closer to the rock formation rising from the flat plain? One of the reasons might be that people are fascinated by exceptional nature wanders, and as we live in the world where greater almost always means better - no wonder that Uluru, the world's largest monolith attracts so much attention. To give you a rough idea: Uluru is 348 m high, rises 863 m above sea level, is 3.6 km long, 1.9 km wide, and the circumference is 9.4 km. The second reason is simple and for us certainly more important than numbers. Uluru altogether with equally interesting Kata Tjuta is just stunning. So you're all set, know all the stats, points of interest, and in a nutshell, you are prepared to see something outstanding. What you might not be prepared for is the immensity and stillness of the rock which will amaze you no matter how many times you've seen photos before. We stayed in the park for three days and couldn't get enough of it. 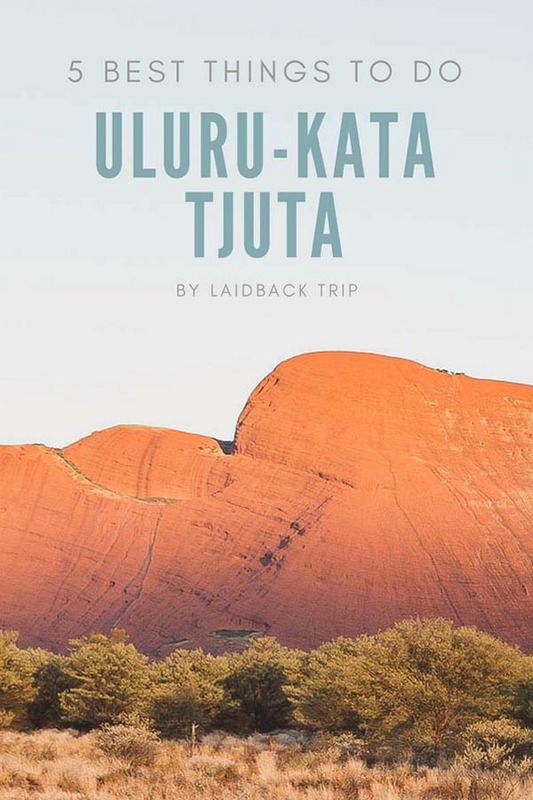 But Kata - Tjuta National Park is not only about Uluru although we can't deny it is the park's main feature. We pulled together a list of 5 best things you shouldn't miss when visiting Australia's Red Centre. Try to catch as many sunrises and sunsets as you can. Both Uluru and Kata Tjuta are exceptionally stunning when the first and last sun rays of the day touch its surface, and this real-time color transformation is one of the main reasons for a visit. The color of the rocks changes from light orange to crimson red and finally to violet dusk and creates an incredible spectacle. There are several viewing platforms around so find your spot and wait for the show to begin. The walk around Ayers Rock base is 10 km long and takes around 3 hours at a leisure pace. The path bypassing the monolith is flat, the only obstacle can be the heat. From a distance, Uluru looks like one solid piece of rock and walking around might not sound like fun. The opposite is true. We were genuinely surprised how the surface of Uluru is diverse as we walked around gaps, ridges, slopes, grooves, canyons and even small valleys with green vegetation carved into it. The Uluru's area is rough without much rain, but from time to time you can spot blackish parched trails hollowed out by water. At the end of the trek, it is possible to walk inside the small cave with rock arts from original inhabitants. There are many places from where to capture great photos, so it is not hard to obey a few photographic restrictions along the way. This walk is near Kata Tjuta area, so we had to drive here from Uluru approximately 45 minutes by car, and we spent the whole afternoon in Olgas after that, waiting for the sunset. Walpa Gorge Walk is a gentle trek, only 2.6 km return which leads you along the natural creek to viewing platform observing a desert refugee for plants and animals between two of the tallest domes in Kata Tjuta. It is sometimes unbelievable seeing the plants to grow and thrive in such harsh conditions, considering we felt so parched in the afternoon heat. The signature hike in Olgas is 7.4 km loop, and it takes you through spectacular landscape. 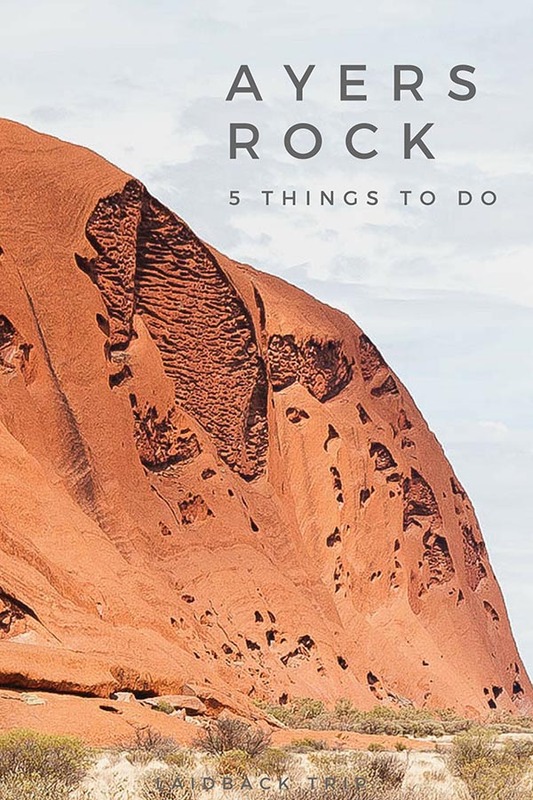 The rocky walk leads between impressive red domes (36 domes around 500 million years old) and climbs to the two lookouts overlooking the desert area. Make sure you'll have time to finish the walk and move to sunset viewing platform. This one is not as easy as it sounds because dry vegetation covers most of the ground here, but after you turn off from Stuart Highway to Uluru - Kata Tjuta National Park, there are places along the way, where the flat red dirt turns into small hills and creates unspoiled red dunes. STILL CURIOUS? DISCOVER MORE ABOUT AUSTRALIA WITH US!